Members and supporters of the Arizona Wilderness Coalition know firsthand that the Sonoran Desert, Mohave Desert and the Sky Islands in Arizona are vast, wild areas, often appearing to be minimally impacted by the human hand. These ecoregions sustain a diversity of common, as well as rare wildlife, such as the recently spotted jaguar in the Dos Cabezas Mountains. Driving through northwestern Arizona on US Highway 93, Interstate 40, or Alamo Road, or through southeastern Arizona on Interstate 10 or Highway 70, there’s a sense that both sides of the highway are sweeping, intact landscapes of public lands that are managed for wildlife, scenery, watershed health, and responsible natural resource production. But is this the case? Well, since 2015 AWC has been on a mission to determine which lands in parts of northwestern and southeastern Arizona are still truly wild, and we’ve been working hard on this goal ever since. Hassayampa Forestry and Ecological has, on behalf of AWC, spent the last two years conducting a citizens' inventory of lands managed by the Kingman and Safford Field Offices of the Bureau of Land Management (BLM) identifying “Lands with Wilderness Characteristics”. These “LWC’s” are BLM lands that possess wilderness characteristics – both legal criteria and intrinsic values – but are not currently protected as wilderness. The Kingman Field Office currently manages 2.4 million acres that include nine wilderness areas, encompassing 415,660 acres. The Safford Field Office manages 1.4 million acres that include six wilderness areas with 75,545 acres. Yet anyone who’s explored these immense regions within this state knows well that there are many more acres of desert and woodland that feel like wilderness, and where the plants, animals, mountains, and waters are not fully protected from permanent degradation. AWC’s inventory team has spent considerable time and had numerous adventures while inventorying and exploring these proposed LWCs. A highlight of their work was a 7-day backpacking trip completed by Joe Trudeau and Amber Fields in the Dos Cabezas Mountains; the same area roamed by a jaguar that the BLM captured in a photograph in late 2016. Amber and Joe hiked a full day through the Dos Cabezas Wilderness just to gain access to the Dos Cabezas Mountains Proposed LWC. This remote LWC is located in the northern part of the rugged Chiricahua Mountains Range, which according to USGS data, contains the highest density of springs of all of the Sky Islands. These mountains are recognized by ecologists as a crucial link for migrating wildlife which move between the Sky Islands ecoregion and the forested landscapes of the Colorado Plateau and the southern Rocky Mountains; a point proven by the recent jaguar sighting. The iconic Dos Cabezas double summit is one of the great desert summits of all the southwest, and surprisingly is not protected by existing Wilderness designation; rather the summits are found within the LWC that has been proposed by AWC. 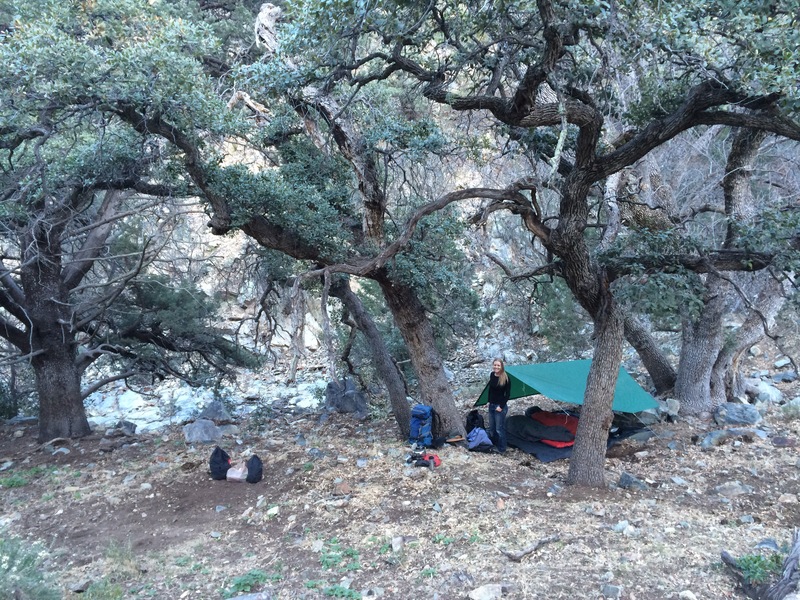 Joe and Amber navigated up and down through more than 3,000 feet of vertical relief, through dense chaparral and Madrean oak woodland to reach rarely visited locations throughout the Dos Cabezas Mountains Proposed LWC. They were impressed by the LWC’s number of springs, habitat and species diversity, intriguing historic and cultural sites, and by the amount of water they found. While we are not sure of the exact location where the jaguar was recently photographed, it may well have been at one of the various springs visited by Amber and Joe on their backpacking adventure. BLM lands within the Safford Field Office contain many wild wonders. AWC’s inventory documented old-growth riparian forest galleries along Bonita Creek to the west of Turtle Mountain; near-pristine native grasslands in the Peloncillo Mountains; some of the best bird-watching in Arizona in the steep and narrow Hot Springs Canyon; and lands now known to be roamed by at least one jaguar in the Dos Cabezas Mountains. AWC has identified 11 proposed LWCs encompassing 167,450 acres (16 individual land units) within the Safford Field Office. 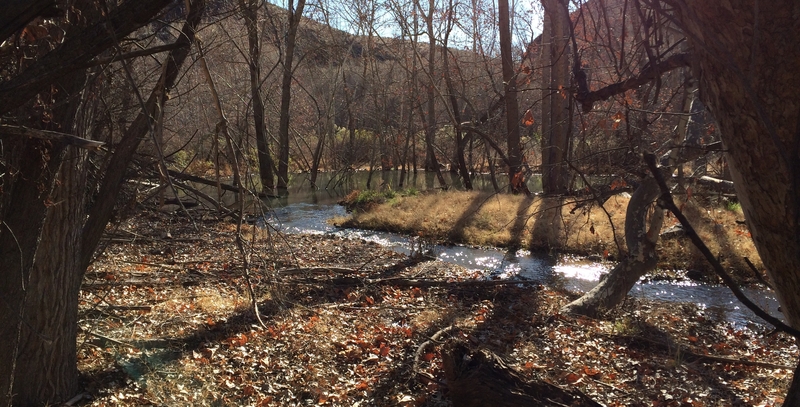 Numerous LWC units add to existing Wilderness Areas: the Dos Cabezas Mountains Proposed LWC with 12,299 acres; three proposed LWC units totaling 16,207 acres that are a natural extension to the Peloncillo Mountains Wilderness; the Fishhooks Proposed LWC contains 19,816 contiguous acres; two LWC units with 9,671 acres contiguous to the Redfield Canyon Wilderness; and three proposed units with 5,060 acres contiguous with the North Santa Teresa Wilderness and the USFS’s Santa Teresa Wilderness. What we found in the Kingman Field Office was inspiring as well: miles of pristine creekside habitat along Burro Creek; an unprecedented granite arch in the Poachie Range; old-growth Ponderosa pine forests in the Hualapai Mountains; critical habitat for Desert bighorn sheep in the Black Mountains; and America’s densest Joshua tree forest at the base of the Grand Wash Cliffs. In total, we identified, mapped, and described 17 wilderness-quality areas totaling more than 507,000 acres! Areas such as the Poachie Range Proposed LWC build on the 129,800 acre Arrastra Mountain Wilderness, and others, such as the 49,285 acre Mount Perkins Proposed LWC and the 38,275 acre Garnet Mountain Proposed LWC have never before been inventoried for wilderness values. One of the biggest surprises is that there is more wilderness quality land out there to be identified, and with your support we plan on continuing this important process of inventorying Arizona’s precious landscapes for lands that deserve the full protection afforded by wilderness designation, or at the very least, management to preserve wilderness characteristics. View photos from our explorations, below. 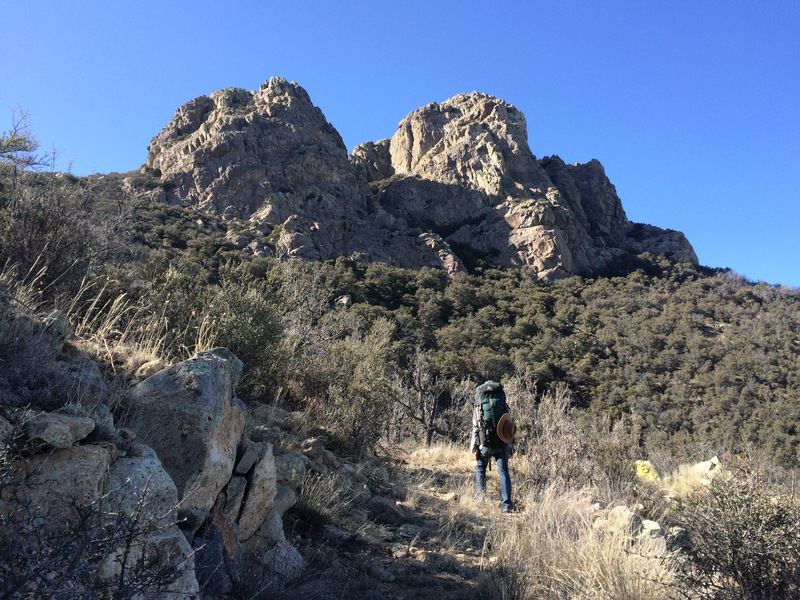 Top Row (L to R): Photo 1: Amber hiking toward the Dos Cabezas in the proposed LWC unit, February 2017. Photo 2: One of Joe and Amber’s campsites among the Madrean oak woodlands, February 2017. Photo 3: An ephemeral stream winds away from the majestic Dos Cabezas summits, February 2017. Bottom Row (L to R): Photo 4: Looking across the proposed LWC unit toward the highest peaks of the Fishhooks Wilderness, namely Gila Peak and its neighbors. Photo 5: Riparian forests and wetlands along Bonita Creek with active beaver, blue herons, mountain lions and more. Photo 6: Looking to the north across the Day Mine Proposed LWC and the expansive Gila Mountains. Hassayampa Forestry specializes in the stewardship, study, and appreciation of wild and managed lands. Learn more. AWC also salutes the wilderness warriors who undertook the original wilderness inventories that led to Arizona’s major wilderness acts in 1984 and 1990. Volunteers such as Craig Friesner and others continue to advance land preservation efforts to this day. Want to see more undiscovered wild lands receiver greater attention? Support AWC’s expanding wilderness inventory work and other wildlands preservation.